Anyway, just to get up to date, I thought I’d tell you about the last section of the book on your left, having already talked about The Suffrage of Elvira and Mr. Stone and the Knights Companion. The third part of this bumper Naipaul omnibus was a collection of stories (some short, some not so) called A Flag on the Island. I’m not a big fan of short stories, but I do like Naipaul, and I was very happy with what I read here. Naipaul’s early work appears to be divided between tales of ethnic Indians on Trinidad and stories set in London’s suburban graveyards, and (as hinted at in my review of Mr. Stone… ) my preference is for the sunnier climes. The writer’s greatest strength is his command of different varieties of English, switching between patois, Indian English and a relaxed, educated standard English without missing a step, enabling him to deal with the ethnic rivalry (if not tension) from several viewpoints. After about ten stories of between 10 and 20 pages, the final story, A Flag on the Island, comes as a bit of a shock to the system, running as it does for over 80 pages. It’s a frame narrative (of which I’ve had a few recently) where an American sailor returns involuntarily to an island where he spent time during the Second World War. The body of the story tells of his life with the locals and the relationships he builds, some of which still hold up on his return to the island. 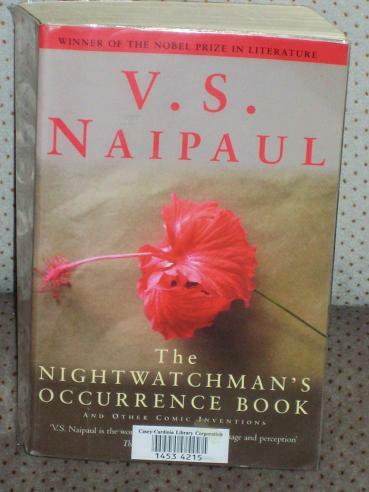 Not a lot of action, but, as is usual with Naipaul, nothing happens in the most enjoyable manner possible. Don’t mention the Australia game. Definitely don’t mention the England goalkeeper.